Alex's Weblog: "Hey, you stuff too much in your bowl!" One time I went to the Westfield Santa Anita mall with my girlfriend and ate at the food court there because we were so hungry and couldn't wait till going back to the Monterey Park area. I was kind of confused since I thought that the patrons are free to take as much food as they like. There were other patrons there and they saw the whole incident. My girlfriend was pretty mad and told him that he's so mean, which was agreed by another woman in the line behind us. Despite this, we didn't want to argue with that staff and just let the chefs there cook our food. That was one of the worst dinner I've ever had, not because of the food (the food was delicious), but because I was angry about how rude that staff treated us. If you think about it, this whole incident was ridiculous. First of all, there was absolutely no sign saying that there's a limit of the amount of food you can put in your bowl. Even if there's such a limit, I expect them to politely tell us not to take too much food; after all, we're patrons, the ones who're paying, right? I don't know whether that staff was just an employee or the boss of the store (since Great Khan's has a franchise program). If he was the boss, that's even more ridiculous. He yelled at us in front of other patrons. Whether he was right or wrong, do you think the patrons who saw this incident would want to go back again if they've other choices? The funny thing was his claim of going out of business if I took too much. Honestly, I'm not that skillful and I can only put a few more pieces of meat and veggie compared to other patrons. How much did those few extra pieces of meat and veggie cost? Let's say $3 (their meal was like $7)? For 3 damn bucks, they decided to lose two customers forever, not to mention the other ones who never want to go back because they saw the incident. What kind of business brain did that boss have? Do you think that Pizza Hut loses a lot of money because of these greedy patrons? I don't think so. Why? 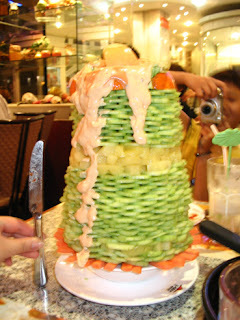 There's probably only a handful of people who can build such a salad tower. Greedy people like me seeing such a photo will probably go try it myself (but can't get as much of course). This is a great marketing campaign a lot cheaper than doing ads on TV! Have u tried BBB to file a complaint? that's so stupid! The whole point about going to mongolian bbq is that you can stuff as much food into that bowl as you can!